This is one addictive game! Tic tac toe countdown pits players against the timer to see how many tic tac toe's a player can get before the time is over! 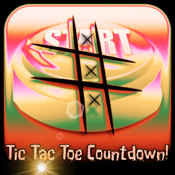 Tic Tac Toe Countdown will make you break a sweat as you try your best to beat your score over and over again! • A true unique tic tac toe experience! • Tic tac toe with a twist! • How many Tic Tac Toe's can you get in 60 seconds?